TDM just released its 2Q2010 results. Net profit was RM12.7 million or 5.77 sen per share for 2Q 2010, making 1H2010 net profit totaling RM32.1 million or 14.7 sen per share. Though net profit rose 38.6% y-o-y, on a q-o-q basis, net profit dropped 34.9%. PBT was RM16.86 mil in 2Q 2010 as compared to RM26.8 mil in 1Q2010, which was about RM10 mil drop. (RM6 million drop in PBT from plantation) Drop in palm oil prices: Average CPO price for 2Q2010 was RM2,475/MT as compared to RM2,568/MT in 1Q2010 which was RM93/MT decrease (MPOB data). 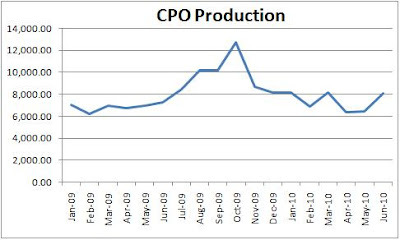 CPO production for TDM dropped from 23.2K MT in 1Q2010 to 20.9K MT in 2Q2010 which is a 10% decrease. These two contributed to lower revenue and lower margins. (RM4 million drop in PBT from 'Other Income') Earnings from "Other income" were rather inconsistent in the past. This segment consists of investment holding and provision of management services (Medical centers, properties, tour agency?) Recorded losses of 0.5 million in 2Q2010 as compared to earnings of RM3.9 million in 1Q2010. Nonetheless, earnings from its healthcare segment continued its uptrend with earnings of RM2.7 million. Though this quarterly performance might be disappointing to some of us, this will only be temporary. 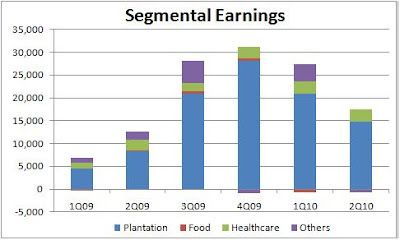 The main drag for this quarter were the lower production and palm oil prices. However, these two will no longer hold true for 2H 2010. Firstly, palm oil production has always been higher in 2H as compared to 1H. To recap, TDM recorded increase in CPO production of 41.6% in 2H 2009 over 1H 2009 (58.45K MT vs 41.3K MT) while at the same time 1H 2010 CPO production was higher than 1H 2009 by 7%. Thus, production of CPO in 2H 2010 might reach 60K MT as compared to just 44K MT in 1H2010. In addition, CPO prices will likely remain high in 2H 2010 as previously mentioned in my previous post. These two factors of CPO prices and production which drove the earnings down this quarter will reverse in 2H 2010 to provide boost to TDM's earnings. 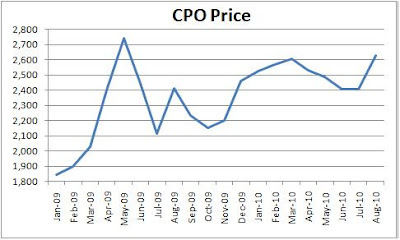 Assuming 60K MT CPO production in 2H2010, CPO price of RM2,600/MT in 2H 2010, earnings before tax from healthcare and 'Other Income' of RM5.5 mil and RM1.7 million respectively during 2H2010 coupled with tax rate of 24%, net profit will still touch RM79.7 million or 36.3 sen. 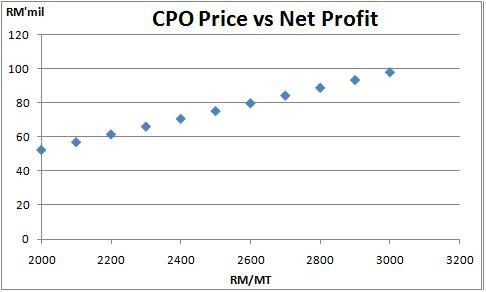 I've done a simple TDM's earnings sensitivity to CPO prices (ranging from RM2,000/MT to RM3,000/MT) as shown below: As shown from the graph above, net profit could range from RM52 million to RM98 million or EPS of 23.8 sen to 44.6 sen for the whole of 2010 based on CPO prices ranging from RM2,000/MT to RM3,000/MT during 2H2010 (Will the CPO prices be even higher?). PER 2010 still looks attractive at 6.6x with 2010 EPS of 36.3 sen assuming CPO price of RM2,600/MT and CPO production of 60K MT during 2H2010, supported by net cash of RM98.3 million.